The sole purpose of the tiki taka playing style was to overload the opposition in all phases of play, in all areas of the pitch and attack with fluidity and beautiful play! Not in a gung-ho style, but still trying to conquer the opposition by good structures which ensures defensive solidity as well as attacking proficiency. The attacking mentality was in the players nature and the manager looked at it as the best way to defend – building the entire philosophy around the concept of attacking to defend. By playing with an high defensive block which congested play to the middle third, pushing the opposite team deep into their own half giving them little time or space to counter, it laid a great foundation to create goal scoring opportunities, shots and goals of course. At the time of writing (16.02.2015) Barcelona is the 6th best club of the 5 biggest European leagues when it comes to shots per game (16.7 shots) scoring 67 goals in the Liga BBVA according to Whoscored. This is a slight increase from the successful season of 2009-2010 (15.6) and 2010-2011 (15.8), where Barcelona scored an incredible amount of 98 goals in 09/10 and 95 goals 10/11. At the moment Barcelona scores an average of 2.9 goals per game, a slight increase of 0.2 from the 2008-2009 season were Barcelona recorded 105 goals. While the amount of shots tells us nothing about were the goals came from, the statistics proves how Barcelona aimed to overload the opposition and how far into the opposite defense they looked to get before shooting. It shows you how successful the playing style was/are and their desire to score goals and win matches. 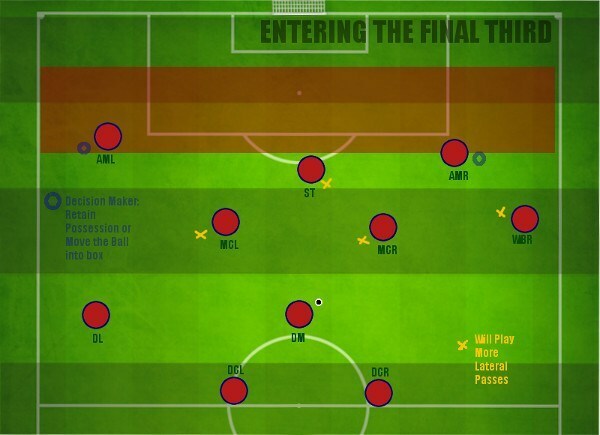 Now the time has come to dissect Barcelonas play in the attacking third by looking at the tools they applied to enter the final third and how they wanted to create chances. For the attacking phase, control and short passing play was as evident as in the build-up phase. But the result of the build up phase was that Barcelona could vary how they would enter the final third and that there was a number of ways to move into the final third effectively. Some would claim they wanted to pass their way to the back of the net, but in my point of view it was only one of the tools to ensure ball movement – forcing the opposition team to move in order to create space – either it’s in the middle or on the flanks. 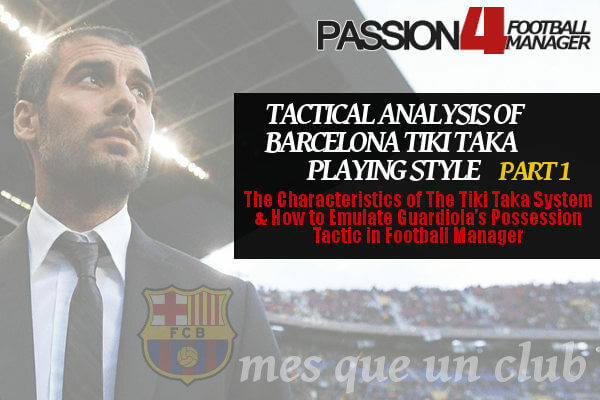 The Barcelona Tiki Taka playing style aimed to create more distinct goalscoring opportunities than the opposition. This equals to creating more clear cut chances within Football Manager. In order to create clear cut chances players must be free of their markers and in a position to score, either he stays in vacant space or moves into it. A situation where a player is in an obvious goal scoring opportunity and is expected to score for example by being clear through on goal. NOTE! The match engine doesn’t define CCCs and half chances perfectly, sometimes one can be more apparent than the other. In order to unsettle the oppositions block and create chances it’s important that the team utilized movements and vasts amount of passes which looked to unlock the oppositions defensive block. This is also apparent from the official statistics which proves that Barcelona scored most of their goals from open play. Barcelona used several tools to force the opposition team to move in a bid to create clear cut chances. Here I like to go through the most significant features of tiki taka in the attacking phase, which can be replicated in Football Manager 2015. Overlaps was often utilized on the right flank between the wing back (duty: attack) and the right inside forward (duty: support), but could also happen on the left flank as the left wing back (duty: attack) gets forward hugging the touchline while the left inside forward (duty: attack) cuts inside or in some rare cases Iniesta overlaps Villa. By utilizing overlaps it expanded the playing area in the attacking third and provided the team another aspect of their play; the option to cross from byline, provide through balls from a player with better vertical perspective or simply create space for the inside forwards / right wingback to shoot from the edge of the box. The overlaps has one objective: to create numerical superiority on the flanks: 2 versus 1 – a situation which makes the opposite tracker uncertain on who to track. In perspective of Barca’s desire to control the match – these overlaps forced the opposite wingers to participate in the defensive phase making them use up energy chasing the ball rather than staying forward as an counter-opportunity. the inside forwards would also cut inside both with and without the ball. This movement let the wingbacks get further forward as it created space on the flanks. Either the inside forwards sit narrower or not, this movement creates a 3 versus 2 in the center of the field, while it creates a 5 versus 4 in the final third, if we imagine the opposition uses a 4-4-2 in the defensive block. one-twos happened frequently amongst the more advanced players on the tip of the center diamond (Messi and Iniesta), who had the ability to use the inside forwards as an option to flick the ball to and get it back from. The direct forward runs from the player aimed to cause panic, while the redirection of the ball looked to cause confusion as the opposite markers now has to take into account this complex scenario – a crucial decisive decision has to be made within milliseconds; close down, cover for the run or stay. Either way one of the players will get the required space to make a purposeful use of the ball. The one twos aided both the tempo of the match as well as providing the team the chance to move inside the penalty box – where most of the shots came from. switching play from one side of the pitch to another in a haste in order to catch the opposition off guard as one or two players are free of marker on the opposite flank (normally Iniesta or Villa, but could also be Alves inside the attacking third) were used from time to time. Switching play were often done when playing area became too congested and gave less opportunities to create goalscoring opportunities. The switch of play changed the point of attack to a player with depth – furthest away from ball zone. Most often it was the case for Iniesta and Busquets who could switch point of attack to Alves / Pedro, but it could also happen from the right side to the left to Iniesta/Villa (depending on their positioning) because of their advanced positioning to stretch play. While this is only the introduction on how to create goalscoring opportunities it shows you some of the player role behaviours, player instructions and team instructions we look to apply when re-creating a FM15 tiki taka possession tactic. While the build-up phase merely focused on retaining possession as a defensive purpose, there were an increased focus on lateral passes played through channels onto a moving player (3rd man runs) in the attacking third. The playing style of tiki taka in the attacking third were as much about playing patiently until the right space opens up, working the ball into the box. In this phase they could go from slow intricate build-up to quick passes between 2 to 3 players – moving the ball so fast that the opposite marker is disorganized and out of position in a second. This was the sole purpose of the passing play in order to enter the final third. Here the bid to enter the final third relied on the decision-making of mainly 4 players who had the license to split the opposite defensive line with lateral passes in order to create chances – these players will normally make the most key passes of the team. These players is illustrated below. In regard to Football Manager I interpret them as playmaker roles, who will play more risky passes by default. You might be surprised by the inclusion of the right wing back, but because of his attacking attitude, he would often be in a position to let the team enter the final third because of his frequent forward runs and his connection to primarily the right inside forward and the right central midfielder as he takes up position in the middle third. While the four players marked with yellow X would play more through balls which gave the team the chance to enter final third and exploit space behind the oppositions defensive line, it was primarily the inside forwards who made the final decision on when to make an distinct effort to create goalscoring opportunities or when to simply retain possession by redirecting the ball to the more creative playmakers within the final third. What might be most interesting from the illustration above is how the team were able to enter the final third from all over the line – utilizing the full width to create goal scoring opportunities by high number of lateral passes to get into final third quickly, despite being obsessed with playing possession football. This was particular enhanced when the left wing back had an attacking duty as well. So how important was the wing backs in the bid to enter the final third? Barcelona favored to use the full width when in possession in order to increase the amount of spaces to exploit. As the wing backs looked to stay wider than the rest of the team, especially with the symmetric 2-3-2-3 formation (example B of page 1), it created more space to exploit, and generally better opportunities to move into the attacking third. While other teams might attack solely down one side – their strongest – Barcelona looked to attack equally down all sides (against Athletic Club 08.02.2015 it was 32% right, 33% middle and 35% left according to Whoscored.com). This was completely opposite under Guardiolas tenure, as the emphasize on the right side (35% in 2010-2011) was more evident. In general you can say the wing backs had an equally important role in the build-up play and the transition from defence to attack when playing down the flanks, similarly to the importance of the central core trio (Busquets, Xavi, Messi) down the middle. The wingbacks would both aid with the ball circulation and move into space in order to overload the flanks (right side more often than left) – increasing the amount of passing options for the more centralized players. The flanks acted like pressure relief zones letting the team play out from the back through wider areas of the pitch forcing the opposite team to move. As you might have discovered a traditional 4-3-3 formation leaves a lot of space between the fullbacks, central midfielder and the winger. By letting the wingbacks move higher up and participate in the ball circulation it did not only decrease that space, but also provided a better link between those three. The importance to give the central midfield a short passing option out wide which lets the team enter final third is perhaps most apparent, as illustrated above. The narrowing of the triangle is also purposeful to stabilize and balancing the shape as they provide a cover for the space between the fullbacks and wingers which opponents could take advantage from when trying to counter. The Barcelona tactics and systems consists of what I would describe as two units; A and B. Unit A consists of 5 closely connected players which let the team play quick short passes and attack with lots of movements. Unit B is substantially more focused on stretching the play relieving more spaces to exploit between the four players, in additional to keep focus on setting a solid back three based on defensive cover for the more attacking minded players in advanced positions (Iniesta and Villa). The numerical advantage on right versus the disadvantages of left impacts the triangles, how the players utilize the process of retaining possession and the mentality approach when regaining possession. It was a clear difference on how Barcelona attacked down the right and left flank, if we shall focus on the difference between the roles and capabilities of Abidal versus Alves, but this difference was not as apparent when Maxwell or Alba played – see 4-3-3 example B of page 1. In the illustration above you will see that the triangles and rhombus’ shapes created by the system ensures that the wingbacks have at least 2 passing options – maximum 4.
iv) Messi who would either drop deep or push to the side depending on what was most beneficial under the specific circumstances. The movements and transition from defence to attack made sure to keep the triangles and shape – providing you some of the essence behind the statement of being “always in possession”; as one player takes over the zone of the other whilst looking to enter final third. Depending on the location of the ball of course, all the players within their unit moved closer to their teammates in order to create numerical superiority. When playing down the flanks, centre players moved closer aiming to squeeze play to the sides and overload the opposite team with synchronized movements down the flank. For example in the illustration below, Alves gets the ball from Xavi, but makes a poor first touch that gives the opposite markers time to close him down. Alves tries to relieve pressure to Xavi, despite having Pique in cover, but the ball is lost to Real Madrid. Still you can see the triangles between Pique, Xavi and Alves, or the rhombus shape which includes Messi and the passing options he would have if he made a better first touch, simply because his teammates moved closer to him looking to create numerical advantage – 3 versus 1 (Benzema) in phase 1 and 5 versus 4 in phase 2 (after loosing the ball). Illustration from minute 4:40 Barcelona Vs Real Madrid 5-0 29.11.2010. See full video at Youtube here. There were many advantages of why Pep Guardiola opted to use Daniel Alves as an highly attacking wingback (playing something similar to what we can describe as a complete wingback in Football Manager). The forward runs and attacking attitude of Alves resulted in an high number of final third passes – making more passes on the other half than his own – which is important in order to create goalscoring opportunities. While Alves recorded 55.2 passes per match in average in the final third during the first half of 2010-2011 season according to Zonal Marking, he recorded 78% passes per match in average the same season providing 15(!) assists from right flank. Rather incredible stats considering his default positioning and role. Alves was an important figure behind Lionel Messi’s goal scoring records in that period making 52 assists between 2009 and 2012. Here I will give you some of the advantages of Daniel Alves’ attacking play, which I find most important, in order to help the team to enter the final third – which was the objective. Alves stretched play by staying wider than Pedro increasing the amount of attacking threats and literally giving the opponent more troubles to track every run in the final third. Alves provided the team with the chance to enter the final third by creating a numerical superiority down the right flank, normally 2 versus 1, since most teams uses a 4-4-2 formation whilst defending (out of possession). The movement from Pedro as he moves vertically towards the middle, is as important as Alves’, since he needs to create space for Alves. The opposite marker needs to make a quick judgement on who to track – Alves or Pedro? The movement from Alves often resulted in opposite teams using a defensive minded player (a traditional fullback) as left winger/midfielder literally forcing the opposite team to be more defensive minded and less lethal down that flank. As Alves moves a head of Pedro, the triangle is kept while the team looks to enter final third as it ensures the supporting player has at least 2 passing options ahead of him (see Xavi passing options in the illustration above). While Pedro and Messi are positioned with their back against the goal, Alves has full vision on what’s ahead and becomes more of a threat. All he needs is to time his run, and the supporting player to time his pass. Since he is positioned deep he will have time to accelerate reaching his top speed before becoming offside making it extremely hard for his marker to catch up with him as they will need to turn. Alves’ deep attacking runs gives the team the chance to change the point of attack quickly as he sneaks past his marker on the opposite half of where the ball might be at the moment. The angled pass from center towards Alves (at around 45-70% angle but never 90% lateral) lets him control and meet the pass far easier as the ball comes within his side view rather from behind his back, which normally happens for teams who play with a narrow formation with direct passing play to one or two forwards. Alves’ positioning and attacking mentality literally caused the opposite team to put a marker on him tracking his movements and runs. From time to time, this tactical approach benefited Barca as it created a numerical superiority in another area of the pitch leaving more space to exploit as Alves stayed wide. As one player is man marked, another player is available and free of marking, since at least one opposite forward will look to stay in the area between Barcas DC and DM for counter attacking opportunities. Another valuable point is that the opposition team would be less lethal down that side as the tracker focuses more on defending rather than attacking and uses much of his energy to track Alves. This means that Barcelona ‘controlled’ the side the opposition team would attack down – as its more likely they will attack down their right side facing the covering WBL. Remember that the same points mentioned above could be said about the left wingback when Maxwell played. No matter if Abidal tended to defend as a third defender, he had the licence to move higher up the pitch when the situations called for it – for example facing weaker teams. He would act very similar to a supporting wing back in my point of view. Barcelona 2010/2011 statistics proves that the team looked to play down the middle of the pitch far often than any other LIGA BBVA clubs. It was also in the center diamond you would find the ‘best’ players of the team – the core unit. With excellent creativity/vision, flair and technique the midfield force created the most ideal outlet to utilize quick passing play in the final third. The central diamond could be regarded as the backbone and the foundation for the extreme possession tactic Guardiola utilized. It was here the four playmakers dictates the tempo of the match and utilized a passing play which impressed the whole world. Now it’s time to take a brief look at how Barcelona utilized the player positioning and movements in the center to both create numerical superiority and more distinct goalscoring opportunities. One of the most significant players in the middle of the pitch and the heart beat of the team was Lionel Messi. He orchestrated the attacks with precision and determination. To have such a player in the team is extraordinary, as he is both a creator and a goal scorer. He has the ability to find space in the most congested areas leaving his marker with the doubt; “shall I track him or shall I stay?”. It’s not only without the ball Messi is brilliant. With the ball he possesses the ability to get past 1, 3 or even 5 players through his acceleration, dribbling and flair, while without it he has the potential to unlock any defensive block with a vary of passes; both direct and short, as he possess excellent technique, first touch and passing. He possess a magnificent football intelligence which gives him an advantage on the pitch as his vision and movements creates troubles for the opposite markers. 1) if the opposite team man-marks him he aims to drag players out of their position opening up space for the two inside forwards plus center midfield left to run into. 2) by dropping deep he acts like an advanced midfielder who aims to find pocket of spaces. The movement lets him actively engage in the build up play creating a numerical superiority around the ball zone. By dropping deep he also finds the space and time to let him turn in order to have a correct body positioning to either play in others or create chances for himself. As he is facing the oppositions goal again, there are a vast of opportunities which opens up. Similar to Xavi, he not only wants the ball at his feet in the build-up phase, but looks to roam into space trying to exploit the tiniest areas, which he felt he could take benefit from. Messi frequently covered large areas of the field in order to make himself available for a pass – more frequently down the center right half of the pitch. From the striker position Messi dropped either in between the opposite defensive and midfield line exploiting the vulnerable space between the DC’s and MC’s or between FB and MR/AMR instead of just staying up front which made it seem like Barcelona played a strikerless formation. The main idea of not having any player designated as a sole forward was to let Messi run into that area and finish off attacking moves instead of staying in the zone, which lets the opposite markers have better control of his movements. For Guardiola the ideal striker doesn’t work permanently in the box, instead he arrives there at the culmination of a collectively-constructed attack. By playing between the lines, the movement gave the supporting players the additional passing option which increased the teams ability to enter the final third as 2 passing options becomes 3 or even 4. In additional, as he leaves his area, it opens up the possibility for both inside forwards to cut inside from flank – leaving a huge space behind the opposition defensive line as they pushes up. setting full speed against the opposite defensive line by running with the ball down the center, moving into the attacking third or penalty box utilizing his excellent dribbling capabilities, close control and balance as the ball is glued to his feet. Messis unpredictability with the ball forced the opposite team to be cautious when countering him. He also mastered a wide variety of passes; lobbing the ball over the opposite defensive line, longer more direct passes into space which the wide players could run onto, or quick lay offs which changed the rhythm of the play. If we take into account the example B of the 4-3-3 formation, it transits from a 4-3-3 / 2-3-2-3 formation to a 2-3-5 formation in the attacking phase – literally re-inverting the classic pyramid, which was most prominently used in the beginning of the 20th century and made famous by Mathias Sindelaar (first false nine) and the system of the ‘Danubian Whirl’. By playing with almost 5 forwards, Barcelona overloaded the opposite team creating a numerical advantage against the common 4-4-2 formation used in the defensive phase. This was helped by the central defenders who provided the needed depth for enhanced ball circulation and cover, which lets the attacking wing backs push higher and into the final third. The wingbacks would then provide the main width in the final third stretching the opposite defensive back line in order to open up space for the forward trio in front of the penalty box. The art of creating more distinct goal scoring opportunities was to effectively play through the zone 14 in order to both create chances and shots. Football statistics, analysis and studies proves that the zone 14, the area immediate outside the penalty box, is vital to utilize in order to score goals, as more goals is scored from key passes and assists begun from that area. By effective use of that area more goals can be produced from open play. The zone 14 is effective only when exploited quickly when the point or direction of attack is changed with a short pass or dribble. The optimum time of attack should last no more than 8 seconds. Barcelona looked to dominate that area by numerical superiority, technical skills and sublime movements. While other teams in the past (France 1998 / 2002 – Zinedine Zidane) used one primarily player designated to that zone, Barcelona set up their team with no less than three skillful players; Xavi, Andres Iniesta and Lionel Messi – all capable to make those final passes which unlocks the defensive block either with excellent vision, sublime technique or a lethal mix of balance, low center of gravity acceleration and dribbling. While these players looked to dominate that area, the two inside forwards would stay right outside the zone 14 looking to run into the penalty box penetrating the defensive line. While these players focused on creating goalscoring opportunities, the holding midfielder in Busquets would provide depth and cover forming a solid diamond or a rhombus. While Xavi in the build up phase looked to primarily retain possession by passing the ball to a players feet, he slightly changed approach in the attacking third – moving from patience build-up to urgent through balls. Since he looked to stay a bit deeper than Messi and Iniesta he would have full perspective and far more passing options than the wide players – making him able to change the point of attack in a moment making play far more unpredictable. One were the shift of tempo, either through passing play or through movements, or a combination of both. Here it was mainly Xavi and Messi who dictated play and tempo – deciding where to penetrate from. If the defensive line looked to stay the players within the diamond could hold up the ball or make a false touch to entice one player to rush out before changing the tempo with a quick vertical pass, lay off or initiate a one two – or a scenario which involved all three (for example vertical pass from Busquets to Pedro, lay offs to Messi who initiate a one two with Iniesta/Villa). If the opposition decided to stay and wait, Messi or Iniesta would often accelerate with the ball at their feet directly at the opposite marker forcing them to keep their balance and make an intelligent decision on whether to close down or sit deep. By dribbling it destabilize the defensive block as the opposite marker has to take action – tackle to the ground, tackle on his feet which forces him to leave his position in order to stop the run or simply drop deeper which creates space for an accurate lay off or through ball to one of the inside forwards. Another approach which looked to destabilize the opposition were opposite movements normally between the players in the forward line and the two midfielders or the attacking wingbacks. Here the fluid play, where players roamed into pockets, forced the opposite team to move as it aimed to stretched the opposite formation. Here we can imagine Messi who drops deep while Iniesta runs forward, or one of the two inside forwards cuts inside while the attacking wingbacks pushes to byline, but it could also be a matter of intelligent positioning of Messi, Iniesta and Xavi who looks to play between the lines – moving away from the ball zone in order to let another move into it. The third way to destabilize the defensive block was to take advantage of the full width asking wingbacks to stay wider and use them in the ball circulation in front of the penalty box forcing the opposite team to move from side to side. The wingbacks could then easily play in the inside forwards who sat narrower exploiting the pocket of space between the opposite fullback and central defender – which gave the wing backs an ideal opportunity to play a 60 degrees pass from byline to the corner of the penalty box. To summarize, you can say Barcelona looked to have a vast amount of movements into the penalty box – meaning that the team with the center diamond would play through zone 14 and play vertical passes (final passes) into the 18 yard box before a shot on goal was completed. This is also evident in the shot statistics, which you can see below. The only time Barcelona would take long shots were to finish off attacks were they could not penetrate between lines since the opposite defensive block were compact and stable – impossible to destabilize them). Long shots came normally from Lionel Messi or Andres Iniesta who could shoot from the edges of zone 14. If we look at the statistics of shot zones, Barcelona have recorded 10% shots within the 6 yard box this season, 57% inside 18 yard box and 33% outside the box compared to 2010-2011 (image) and the 2011-2012 season where the amount of shots within the 18 yeard box was raised to 60%, while the amount of shots from outside the box where similar: 33% according to Whoscored. An average of 3 shots per game recorded Lionel Messi within the penalty box that season, while David Villa recrded 2.4 shots per game in average. While Messi favored to use his left foot (playing in a right center position), Villa favored to shoot with his right foot, which is only natural cutting inside from left.